I talked in my previous post for Halo that I've been wanting to shoot most athletic and sports type commercials. I really like them because growing up all I did was play sports and most athletic commercials are very moody and stylized which I love. Not even 2 weeks after shooting Halo I was rushed into shooting a spot for Doug Cox and American Giant. The spot was simple, a few shots of people wearing American Giant workout gear walking straight and then intercutting sports shots and moments that encapsulate the sports world. I'm always very hands on when it comes to pre-production so when we are looking for locations I help our producer look for locations. This would be a 2 day shoot with day 2 needing to be at a location that would accomplish every setup we needed while day 1 was running to specific locations around the bay area. Doug and Scott scouted the bay area locations and Scott and I discussed options for the second. We wanted a baseball field, track, classroom, and a few other options. We initially thought of the Berkeley Recreation center where we had previously shot a few spots for Google however they are currently under construction. Then Scott had the idea of seeing about shooting at my old high school, Dublin High. I graduated in 2009 and while I was leaving the school was undergoing total renovation to accommodate all the new homes and update the school. I go back to visit a few times a year to talk to the kids and I knew this would be the perfect location. We reached out to the video teacher Mike and worked it out so that we could shoot around the school during the normal school day without disturbing anything. We started off the day bright and early in the Marin headlands in the North Bay. The location was a simple road in a forest that perfectly rounded over the road. Originally this location was scouted for the look and the fog but of course the day we shot had 0 fog. We arrived before the sunrise and prepped in the dark. Today was going to be a tough day for a matter of reasons. We rented extra batteries because everything was going to be ran off batteries, including the client monitor, I didn't have my normal AC John who I've had on probably every shoot I've done in the last 3 years, and we were run and gun with a steadicam. I had luckily brought a putt putt generator as backup to charge the 12 batteries we had because otherwise we would have been finished by noon. This also allowed us to use a fog machine our AD Mike had in his car. We didn't think it would work but amazingly we were able to fog up the area we wanted just enough that it stayed and looked like real fog. Our second spot was just down the road and the sun was blasting through some beautiful natural fog. Location 2 was by the bay bridge. We had the back part of a parking lot so that we could shoot our actress walking towards the city. This setup ended up taking much longer than it should have because we had a lot of traffic with people trying to hang out where we were shooting. The shot looked great and my team killed it even though we did a lot of the same takes. Lastly we finished at the beach. I love the beach but i'm not a big fan of shooting at one, especially in cold places like northern california. The biggest concern is sea water and air corroding the camera and metal pieces as well as the windy conditions. After a few takes we ended up finding a look we were happy with and we even got some unexpected birds into a few of the takes. I was most excited for day 2 because it was not only at my old high school but it was handheld so I could react and create shots faster as well as we had more setups that I was excited to shoot. Our first and longest setup of the day was in a football locker room. Of course when we got into the room it felt like a train hit our faces with how strong the smell from the football pads were. I remember the smell from playing football but it was never THAT bad. I knew the look I wanted and there were some awesome skylights but I didn't know how we were going to get a light where I needed it. 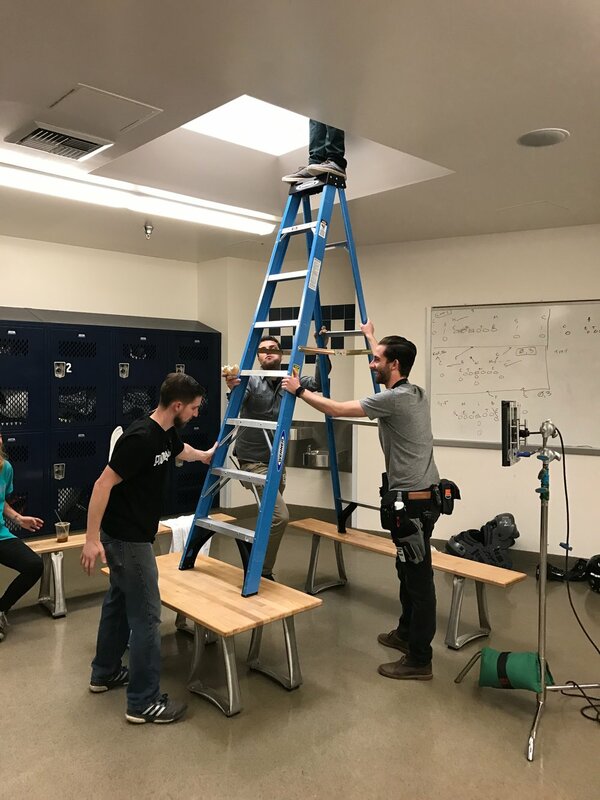 We eventually turned off all the lights and my gaffer Steve bravely figured out a way to get high enough to rig the one light i needed. Me explaining it doesn't do it justice so here are some photos I took of it. This setup was I believe a 1k HMI or maybe 1 600 from above and a small 1x1 LED in the shower to try and backlight any steam from the showers. The room was white so the light bounced all around the room and brought up the ambience. There were also some skylights and windows that were diffused as well. Next we started moving all around the school to the gym, nurse office, video production studio, track, baseball field, car truck, and finally we used the freshmen football game for our football shot. We needed a shot with the stadium lights on and our football player throwing up into a trash can. The freshmen game was coming to an end while we stood at the edge of the stadium getting our final shot. We ended up using a 1x1 LED to amplify the backlight but everything else was mostly natural light. That's the thing about run and gun or shoots that have an enormous amount of setups and a small grew, sometimes you have to just accept what you have. Thankfully I have a lot of experience with this from doing documentary stuff and am able to control a lot of it with my team. Overall the shoot went well! We did find ourselves very stressed and annoyed at some points because we were doing a lot and were undermanned however like true filmmakers we problem solved and made it work. The images from the shoot ended up being some of my favorite I've ever shot. I would like to special shout out our AD Michael for squeezing into the tiny football pads our actor couldn't fit into and spitting out sunny d over and over again. Getting him out of the pads was a massive challenge to the point it took 4 of us to get him out. I tried 2 times on my own and we thought the only way they were coming off was from cutting him out of it. The Making of: Logic's Album Announcement; T.I.T.S.